It's not easy being green! 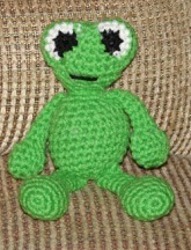 This adorable crochet amigurumi, Freddy Froggy, is easy to make and will be loved by all. Have fun with this free easy crochet patterns. Find this and other fun amigurumi patterns at "19 Free Amigurumi Crochet Patterns"! Finished size-- about 8 inches tall from top of head to bottom of feet. Notes: Do not join rounds unless indicated. Mark the beginning of each round with a stitch marker or scrap of yarn. Rnds 4 & 5: Sc in each sc around. Rnd 7: Sc in each sc around. Rnd 10: Sc in each sc around, join with a sl st in next sc, fasten off. Rnds 5 - 9: Sc in each sc around. Rnd 11: Sc in each sc around. Stuff body firmly. With a length of green yarn, sew head and body sections together. Rnds 4 - 6: Sc in each sc around. Rnds 8 - 15: Sc in each sc around, at the end of rnd 15, join with a sl st in next sc, leaving a length of yarn for sewing, fasten off. Do not stuff leg. Sew opening at top of leg closed. Sew legs to bottom of body. Rnds 3 & 4: Sc in each sc around. Rnds 6 - 12: Sc in each sc around, at the end of rnd 12, join with a sl st in next sc, leaving a length of yarn for sewing, fasten off. Do not stuff arm. Sew opening at top of leg closed. Sew arms to sides of body over rnd 12 to align with legs. Row 3: Sc in each sc across, fasten off. Row 3: With green yarn, sc in each sc across, fasten off. Sew one front and one back eye section together over the sc of row 5 only to form one eye. Stuff eyes and sew onto top of head. Note: Pin eyes in desired positions before sewing. With a length of black yarn, embroider mouth onto center of face. I seem to be collecting quite a few little animal toys to do. It is one of our charities for my crochet club, but narrowing them down to just a few has proven to be a challenge. I have added this one to my definite list though, along with quite a few other I might add! I am confused..My froggies body is smaller than its head! Why does this happen do you think? Anyone? i'm having troubles with row 8 making the head. what does decrease 1 sc over next 2 sc. if you know please let me know. am making this for my grandson. I'm confused. When making the head, what does DECREASE 1 SC OVER NEXT 2 SC MEAN? This is in round 8. I've already started making this fella and I'm stuck at this point.